REVOLUTIONARY packaging for mail order vegetable plants is attracting major interest for a family-run farm near Truro. 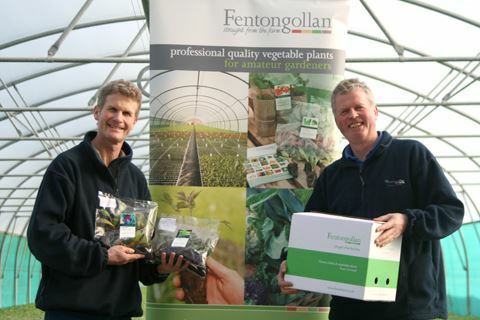 Fentongollan Farm launched the packaging, following scientific trials, which retains the quality of their vegetable plants being sent out to mail-order customers. Now several major mail order companies are interested in securing supply contracts for this year. Brothers James and Jeremy Hosking have been supplying the horticultural industry with vegetable plants for the past 25 years. Jeremy said: "We were staggered by how well the packaging performed in our trials. We can now guarantee our customers that the plants, if correctly stored, will retain their good condition for up to 10 days, although our trials suggested that the plants can happily be replanted after much longer periods." The trials evaluated a range of technologies used in the food industry. From these a product was developed that creates a modified atmospheric environment around the plant, slowing down its rate of respiration but still allowing it to photosynthesis when placed in the light. Fentongollan has extended its range to more than 70 different vegetable plant varieties by mail order and offers a 'pick and mix' service.